I didn't really think a lot when I booked tickets on the KURTC Low Floor bus. 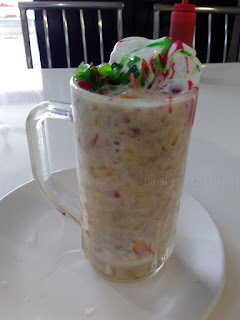 I was in Kozhikode for a function, and had to return to my home town in the afternoon. I directly headed to the Kerala Urban Transport Corporation (KURTC) website to look for services after noon. There was only one - a bus leaving Kozhikode at 1510hrs towards Nedumbassery airport. I was quite shocked when I opened the seat layout for this bus - the only left side window seat left was on the last row. A whole lot of seats on the right side were empty - but then, the sun would be on the right. With no choices left, I book the last row window seat on the left side. I got my mobile ticket (SMS) immediately. 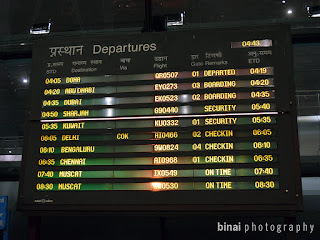 The regional Maharaja's ATR42: Bangalore to Kochi again! 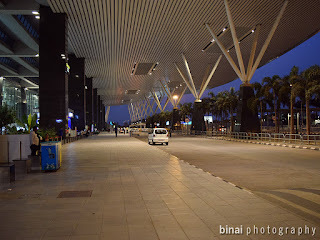 The need to travel back to Bangalore at the last moment had left me shuffled. I was fully disturbed and confused. I wanted to spend April 14, which happens to be Vishu, a day we celebrate as our New Year, with my parents at home. It was almost impossible to find tickets for Vishu eve (April 13th). I tried getting tickets to Trivandrum - which was available. 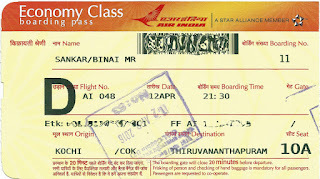 I just tried my luck if redemption tickets were available on Air India - and my luck was very good! The last redemption ticket was available at the point - I grabbed it quickly. Air India was running a promotion on redemptions during weekdays, and that helped me save some miles as well. A Short hop to Trivandrum, en route to Bangalore: Air India 048. It was a fine evening. I was returning from the nearby city of Kochi to my hometown. Sometime on the way, a call from office lands on my phone. The ever familiar sound on the other end, asked me to report at office the very next day. The time was already around 1650hrs. I had originally planned to be at home for a long 10 days, but ended up having to return to work on the 6th day! Now this call came late in the evening, on a peak day. I poured over OTAs soon after reaching home - buses were not a possibility due to timings of buses that had free seats. With the recent cuts from Jet Airways, there were no flights either - there were two flights still open for bookings - and both selling at over 10K! I just then remembered the red-eye flight of IndiGo ex-TRV. This one had tickets that weren't too expensive - but I had another problem. There was hardly sufficient time to go home, change and head to office - and too much time if I were to head to office straight. The elevator travelled two floors very quick, and dropped me on the second floor, which is the departures hall. 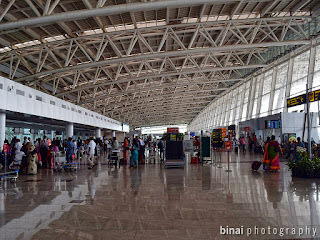 [Read Part-1 here] I landed right next to the SpiceJet counters. 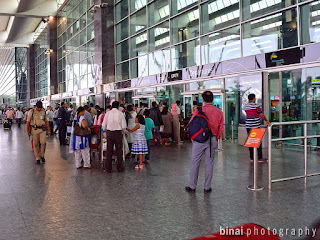 I did not have to go to the SpiceJet counter again - just walked past and headed to another round of security check. I cleared security by 0901hrs and just kept wandering around the terminal for sometime. For some reason, there seemed to be a lot of delays - the gates resembled a government bus station. All seats were filled, and a lot of people were squatting on the floor. I just walked around for some more time, and then decided to head to my gate - #G14 on the ground floor. While walking towards the gate, a flashing word on the FIDS attracted my attention - that was the word "Delayed". And, the flight was mine! It showed that my flight (SG3263) was rescheduled to 1040hrs - a 40 minute delay.